Ceramic inks can be defined as carriers of ceramic fine particle metallic oxide pigments. These inks are used in automatic application techniques. Ceramic ink is suspended in a medium so that it can have the physical consistency suitable for producing fine details. Ceramic inks are available in the form of gel or liquid. Ceramic inks are used on ceramic tiles, which are employed in the construction of buildings. These tiles are commonly used to decorate rooms and restrooms. Ceramic inks are used to print various designs on ceramic tiles. These inks are resistant to water and several other liquids. Hence, they are extensively used to print on ceramic tiles. Large amount of glass is used in the construction industry to decorate various aspects inside buildings. Ceramic inks are used to print designs on glass. Weather-resistant properties of ceramic glass make it an ideal material to print designs on decorative glass. The trend of using decorative ceramic tiles and glass in construction is expected to continue during the forecast period. This, in turn, is estimated to boost the demand for ceramic inks in the construction industry. Ceramic inks are used for printing on ceramic tiles, ceramic tableware, and glass. Apart from these, small share of ceramic inks is employed in automotive ceramics. Ceramics are used in many other industries such as medicine, electronics, and water treatment; however, ceramic inks are not used in these applications. This is hampering the ceramic inks market. Companies are developing other uses of ceramic inks. However, this is an ongoing process. Ceramic inks that are used in digital printing are costlier than those employed in analog printing. However, the amount of ceramic inks required for digital printing is more compared to that in analog printing. This is primarily because the use of digital printing is increasing across the world. Digital printing offers several advantages over analog printing, namely low cost, higher customization, mass production, environment friendliness, and rapid changes to designs. Chemical formulations and coloring pigments used in ceramic inks for digital printing are different from those used in analog printing. However, ceramic ink manufacturers need to focus more on formulations designed for digital printing technology, as the industry moves to take advantage of digital printing by adopting digital printing technology rather than analog printing technology. These specifically developed ceramic inks also need to cover a wider range of colors and vibrancy so that digital printing can give a wider range of designs. Additionally, ceramic inks designed specifically for digital printing need to withstand a wide range of temperatures and weathers. Digital printing technology was developed after analog printing technology. However, it has managed to replace analog printing technology and become the primary technology employed in the printing of ceramic products such as tableware and tiles. Research and development in digital printing technology has gradually made it usable for various purposes such as ceramic tiles, tableware, and glass printing. The share of digital printing technology has increased due to the rise in applications. Digital technology allows a wide range of colors, combinations, designs, and textures to be printed onto products. The ability to feed complex designs into the computerized system also allows development of considerably complicated designs. Ceramic inks can be bifurcated into functional inks and decorative inks, depending upon where the end-product is used. For example, ceramic tiles can be used for decorative purposes in kitchens of households. These inks can also be used for functional purposes in the bathrooms of households. Ceramic inks increase the attractiveness and décor of kitchens, while they prevent walls from being damaged by water in bathrooms. However, majority of all glass printing is used for decorative purposes. Similarly, printed designs are used on ceramic tableware to improve its attractiveness. Hence, the share of decorative ceramic inks is higher than that of functional inks. Ceramic tiles are the most common applications of ceramic inks. Ceramic tiles are required in almost every construction anywhere in the world. Hence, they account for major share of the market. Commercial construction is more common than residential construction. The square foot covered by commercial construction is also more than that for residential construction. Hence, the share of commercial decorative tiles is higher than that for residential decorative tiles. Ceramic inks are commonly used in ceramic tiles. China, India, and Brazil are the highest ranked producers of ceramic tiles. Of these, China and India are located in Asia Pacific. Hence, the region is the key consumer of ceramic inks, primarily due to the high production of ceramic tiles. Unlike ceramic tiles, the manufacturing of glass with printed designs on it is carried out more commonly across the world. Similarly, the manufacturing of printed ceramic tableware is also common across the world. However, Asia remains the major manufacturer of glass as well as tableware. China is considered the manufacturing hub of the world. This is further driving the ceramic inks market in Asia Pacific. Ceramic inks is a highly fragmented market with the presence of large numbers of local manufacturers. However, a small number of manufacturers based in Europe have managed to gain considerable share of the market. These players include Ferro Corporation, Zschimmer & Schwarz GmbH & Co KG, Chemische Fabriken, Esmalglass – Itaca Grupo, and Gruppo Colorobbia S.p.A.
Manufacturers are striving to develop new applications of ceramic inks. Research and development has led to the use of ceramic inks in automotive ceramics. This trend is expected to continue during the forecast period. Ceramic inks are carriers of ceramic fine particle metallic oxide pigments used in automatic application techniques. Ceramic ink is suspended in a medium to give it the physical consistency suitable of producing fine details. The ink is available either in the form of liquid or gel. This report analyzes and forecasts the ceramic inks market at the global and regional level. The market has been forecast based on volume (kilo tons) and revenue (US$ Mn) from 2018 to 2026, considering 2017 as the base year. The study includes drivers and restraints of the global ceramic inks market. It also covers impact of these drivers and restraints on demand for ceramic inks products during the forecast period. The report also highlights opportunities in the ceramic inks market at the global and regional level. The report includes detailed value chain analysis, which provides a comprehensive view of the global ceramic inks market. Porter’s Five Forces model for the ceramic inks market has also been included to help understand the competitive landscape in the market. The study encompasses market attractiveness analysis, wherein type, technology, and application are benchmarked based on their market size, growth rate, and general attractiveness. 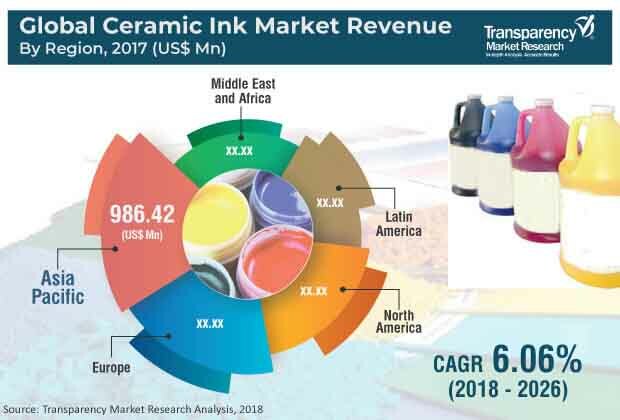 The study provides a decisive view of the global ceramic inks market by segmenting it in terms of type, technology, application, and region. In terms of type, the ceramic inks market has been bifurcated into functional inks and decorative inks. In terms of technology, the ceramic inks market has been classified into digital printing technology and analog printing technology. Based on application, the market has been divided into ceramic tiles (residential decorative tiles and commercial decorative tiles), glass printing, tableware, and others (including automotive ceramics). These segments have been analyzed based on present and future trends. Regional segmentation includes current and forecast demand for ceramic inks products in North America, Europe, Asia Pacific, Latin America, and Middle East & Africa. The report provides size (in terms of volume and value) of the ceramic inks market for the base year 2017 and the forecast for the period between 2018 and 2026. Market numbers have been estimated based on type, technology, and application of the ceramic inks market. Market size has been provided in terms of global, regional, and country level markets. The report comprises profiles of major companies operating in the global ceramic inks market. Key players operating in the ceramic inks market are Ferro Corporation, Zschimmer & Schwarz GmbH & Co KG, Chemische Fabriken, Esmalglass – Itaca Grupo, and Gruppo Colorobbia. Market players have been profiled in terms of attributes such as company overview, financial overview, business strategies, and recent developments. Based on region, Asia Pacific is the major consumer of ceramic inks, primarily due to the large amount of ceramic tiles manufactured in the region. Manufacturers of ceramic tiles are one of the largest consumers of ceramic inks. Printing inks face little or no regulation in many countries. Furthermore, existing laws in different countries are not harmonized with each other. This creates problems with product standardization for ceramic ink manufacturers.